We run a variety of After School Clubs all year round. Some schools deal with their own admin, some we administer via the website. All Clubs run for 1 hour and we can provide all “floor safe” (TM) skates and safety equipment, but you are welcome to use your own. Club start times vary by school but 3:15pm is typical. Non skaters will learn to skate, from first steps, experts will get better and there will be lots of games as well as Gradings and Certificates! Please book using the form at the end of this page. You will receive an AUTOMATIC email within 60 seconds. If you don’t see it, please check: Is it in your junk-mail, or is the email address supplied incorrect? NB. Stonecross Tollgate and Ocklynge are outdoor clubs only. In the event of wet weather, we will run supervised “off skate” activities instead. Such as Skate Maintenance, Quizzes, team building games and activities. 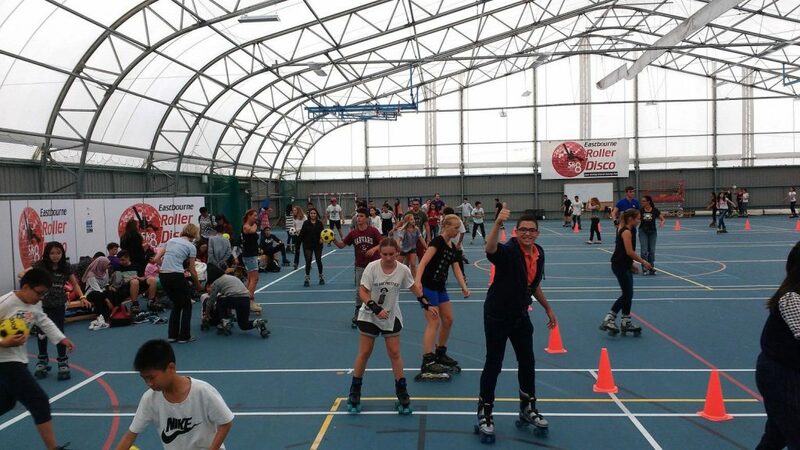 If you’d like to see some of the games that feature in the club, check out the Huge – New Roller Disco at Eastbourne Sports Park, behind the DGH… Eastbourne Roller Disco. We can even handle your Birthday Skate Party from only £3pp! Note : Dates for the clubs vary by school, but all clubs are paid in advance usually for the term. Cost is £4 per session and this covers skates and all protective gear if required. Generally therefore an average term is £40, though we are happy to accept payments by half term if that is more convenient. Our After School Skate Clubs are Popular Year Round – Please CONFIRM YOUR BOOKING PROMPTLY. Confirmation is via payment. Send Cash or Cheque (made payable to SK8school) to 32 Lawns Avenue, Eastbourne, BN211PJ. PLEASE MAKE SURE YOUR REFERENCE INCLUDES THE SCHOOL and CHILD’S NAME. We have a lot of school clubs running and another school might have a child with the same name. Special information we may need - eg. Allergies, pick up instructions, restrictions etc.